An Ear Plug Dispenser is a great way to keep the foam ear plugs you need conveniently at hand. Dispenser bottles contain unwrapped foam earplugs, which can be easily and hygienically dispensed right into the palm of your hand. Ideal for industrial work areas and workshops! Since the ear plugs aren't individually wrapped, dispenser bottles reduce waste and save time - no plastic packages to open and throw away. These dispensers can be refilled with refill bottles, boxes, or bags of plugs in bulk, making them easy to use, easy to replace, cost-effective, and the GREEN choice. Less trash and packaging, making dispenser plugs the GREEN Choice. Reduced cost due to reduced packaging. Reduced cost due to less waste. Employees are less likely to grab a handful and stuff their pockets. Neater dispensing. A row of dispensers on the wall means no more messy boxes to fall on the floor. Foam ear plugs in vending machine packs provide an innovative new way to distribute hearing protection ear plugs industrial workers need to work safely in a quick, convenient, and controlled manner. These ear plug vending machine packs each contain a few pairs of foam ear plugs and are designed to work well with most ear plug and other safety equipment vending machines in industrial settings. With the Moldex PlugStation®, you can afford to put your favorite Moldex ear plugs in all the places they're needed. PlugStations easily and hygienically dispense Ear Plugs right into your hand. Reduce waste and keep your workspace clean and compliant! Just snap a dispenser refill bottle of the ear plugs of your choice onto the One-Touch Pro Metal Dispenser, and the plugs you need are available at just a turn of the one-touch handle. Ear plugs in dispensers are less expensive, reduce waste and help keep your area clean. Howard Leight HL400 Ear Plug Dispensers are a quick, flexible, and economical way to quickly dispense ear plugs in your workplace. The HL400 dispenser may be left free-standing, or mounted to a wall or table near the door. The dispensers come canisters of 400 pairs of Howard Leight ear plugs. Howard Leight Foam Ear Plug dispensers save time and space, and create less waste with earplug dispensers. For big and small operations, dispensers offer an economical, hygienic, and user-friendly source for hearing protection. Two dispenser versions available. (NRR 32) Elvex Uni-Fit™ UF foam ear plugs feature a slow expansion, low pressure, polyurethane foam that helps users get a proper deep-in-the canal fit, and provides for all day comfort. One Dispenser With 500 Pairs of Uni-Fit Ear plugs. Radians ear plug dispensers are inexpensive, easy to use and best of all, they will work with virtually any bulk, uncorded ear plug, including Radians Deviator and Radians Deflector, and many others. These excellent quality ear plugs are provided loose in bulk, in a re-purposed Moldex Plug Station dispenser, which is designed to be disposed of when it is empty. However, the top snaps off, so you can refill it if you like. We just have a few of the Moldex plug station dispensers we have re-purposed, so do not delay. (NRR 30) Got Ears?® Round-30™ PVC Ear Plugs feature an unusually high NRR 30, a simple cylindrical design, neon orange high visibility color and thermo-reactive formulation. Got Ears? Round 30 work in Both Howard Leight Dispensers, as well as in the Elvex and Radians dispensers. There are some important differences in the ear plug dispenser systems we carry (Howard Leight, Moldex, E-A-R, Elvex and Radians). Moldex offers only their PlugStation dispensers which you throw away after use. You can refill the plugstations, but it is difficult and generally not worth the trouble. 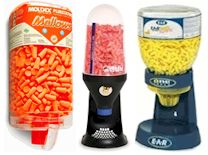 If you want a dispenser with Moldex plugs, though, the PlugStation is your only option, as Moldex does not sell their ear plugs in bulk any other way. E-A-R takes a hybrid approach. Here you buy a base that is designed to work only with bottles of plugs that are discarded when empty. The refill bottles are not expensive, and if you want to take the trouble, these can be refilled with your choice of ear plugs, but they have a small mouth making refilling inconvenient. E-A-R also does not sell the ear plugs in bulk other than in the refill bottles. Howard Leight is our top recommendation for ear plug dispensers. Their refill packaging is ideal, and they let you use the dispensers with any ear plugs you choose, giving you the best overall solution in a dispenser system. Howard Leight offers three dispensers: LeightSource400, LeightSource500, and the HL400. LeightSource400 is a light duty plastic wall or table mounted dispenser, which comes with a reusable bottle. This lets you refill from any kind of container, and minimizes waste since nearly all the Howard Leight brand foam ear plugs are also sold in bulk refill bags. (You can also use the LeightSource400 with any other brand of uncorded ear plugs you choose, as long as you can get them in bulk.) The HL400 is the newest dispenser from Howard Leight, and it improves upon the great features of the LeightSource400. Finally, the Leightsource500 is an extreme-duty, metal, wall-mounted dispenser that will last for years under the heaviest usage. This dispenser is designed to be refilled using Howard Leight refill boxes, but by keeping the boxes from the LeightSource500 refills you buy, you can then refill using any kind of bulk ear plugs, giving you maximum flexibility in the ear plugs you choose to dispense to your workers. It really is in a class by itself. Elvex Uni-Fit Dispenser comes with 500 pairs of Elvex Uni-Fit ear plugs, and the dispenser is refillable with any bulk ear plugs you may choose, including Uni-Fit earplugs which come in a 500 pair bulk refill bag, all of the Howard Leight ear plugs and our own brand, Got Ears? Round-30 Bulk ear plugs, which are the most economical you can buy. Radians Foam Ear Plug Dispenser holds 500 pairs of Deflector or Deviator ear plugs, which means it will hold 500 pairs of any other bulk ear plugs you may wish to put into the dispenser. Much like the Elvex dispenser, the Radians dispenser has a conveniently large refill opening, but unlike Elvex, you can just buy the Radians dispenser without any ear plugs, giving you maximum flexibility. This is a great new entry into the field. All of the dispensers work great, however, and the cost of the different systems are not very different, so you cannot go wrong. Dispensers are definitely the way to go: they will save you money, reduce wasted ear plugs, and reduce the trash problem created by discarded ear plug packets.